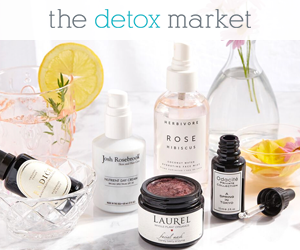 The great thing about the Cocoon Facial Elixir is that while it is recommended for sensitive, easily irritated skin, it also keeps my oily T-Zone balanced, making my skin feel and look less greasy. In fact, the formula features ingredients that provide an effective response to all of my main skin concerns: anti-inflammatory ingredients to calm and heal; antioxidants to stimulate and repair; hydrating ingredients to boost moisture levels; balancing ingredients to prevent excess sebum and breakouts. Aloe Vera – Known to effectively help with hydrating the skin (1). Some studies have also shown that it is effective at promoting the healing of wounds (2). Calendula – Due to its flavonoid content (quercetin and rutin), it is an effective anti-inflammatory ingredient that calms the skin and promotes healing of blemishes. German Chamomile – Tones down redness and soothes the skin. It has been shown to be effective in the treatment of eczema (3). Rose Otto – It helps to restore the natural balance of the skin. Acerola – Excellent source of Vitamin C and antioxidants. MSM (Methylsulfonylmethane) – A sulfur-containing compound that is found in several superfoods such as broccoli, cabbage that can penetrate deeply into the skin and provide hydration. In a 2008 study 46 cases of rosacea were successfully treated with topical application of MSM (4). aloe barbadensis, calendula officinalis (calendula) hydrolat*, rosmarinus officinalis (rosemary) hydrolat*, lavandula angustifolia (lavender) hydrolat*, matricaria recutita (chamomile) hydrolat*, boswellia carterii (frankincense) hydrolat, frequency enhanced water, methylsulfonylmethane (msm), rosa damascena (rose) flower petal powder*, malpighia emarginata (acerola) extract, colloidal silver. *Certified Organic. Gluten-free. Vegan. Alcohol-free. Being that Cocoon is completely free of fragrances and essential oils, it has only a mild herbal scent that comes from the plant extracts and that would most likely not bother anyone, (even the most sensitive noses). As for the price-point, YULI products are not cheap, but the quality is just as high as it can get. It retails for $36 for ml 50 and is worth every penny. You can totally expect me to continue my #TuesdayToners Series and review more face mists in the future, and I promise I will be impartial, BUT I will still keep a bottle of Cocoon in my cabinet, just in case. 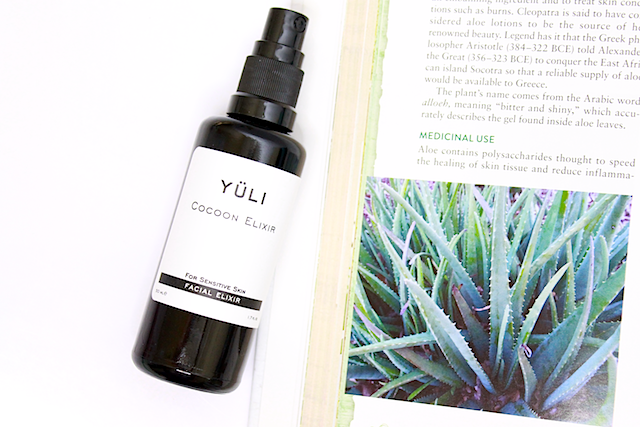 You can find Cocoon Facial Elixir and all the other YULI products at YÜLI Skincare. 2. 14. Davis RH et al. Anti-inflammatory and wound healing of growth substance in Aloe vera. Journal of the American Pediatric Medical Association, 1994, 84:77–81. 4. Berardesca E, Cameli N, Cavallotti C, et al. Combined effects of silymarin and methylsulfonylmethane in the management of rosacea: clinical and instrumental evaluation. J Cosmet Dermatol. 2008;7:8-14.